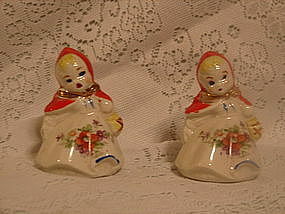 Hull Little red riding Hood Salt and Pepper. Three inches tall. Made by HUll and marked. No chips cracks or repairs. 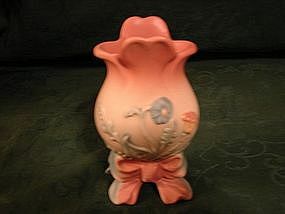 Beautiful Hull Bowknot vase. 6 inches tall x 31/2 inch round. Marked Hull Art USA B2. Mint condition. Original Hull no repro. 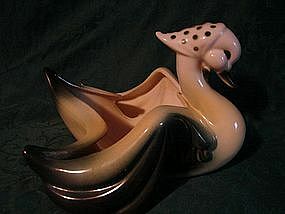 Hull Pottery Bandana Swan planter. Circa 1974. Marked Hull 1974. 10" long, 10" wide and 7 1/2" tall. Excellent condition. 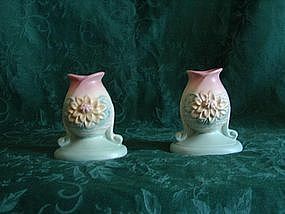 Hull waterlilly candle holder pair. Hull waterlilly candle holders. 4 1/2" tall, 4" long, and 3" wide. Mint condition. I also have centerpiece bowl to match. 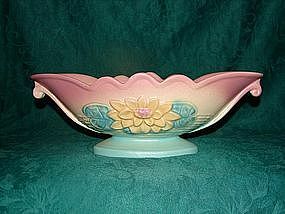 Hull waterlilly centerpiece bowl. 13 1/2" long, 5" tall, 6" wide. Mint condition. I also have candle holders to match. 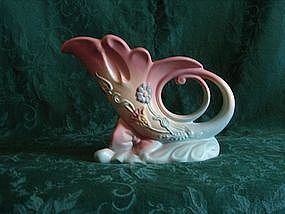 Hull bowknot cornucopia vase. 10" long and 7 1/2" tall. Beautiful piece in mint condition.